Biography: Lisa Bousted, mother to four girls set up Aquarius Swimschool in North Devon in 2000 and has taught over 10,000 babies, children and adults to swim, with over 1,000 swimmers per week on her books. Lisa is qualified with the UK’s Swimming Teachers Association (STA), the Amateur Swimming Association (ASA) and Australia’s Austswim. She not only teaches children, adults and those with disabilities as well as Aquafit classes but specialises in teaching babies and toddlers. Since 2008 Lisa has also tutored others in each of these disciplines to become teachers in their own right. 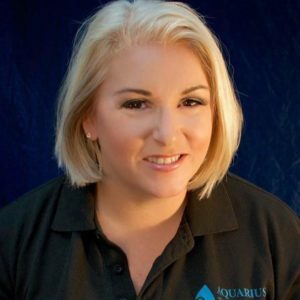 She not only trains new swimming teachers but also helps qualify others in First Aid through her second company, Aquarius Training. Lisa is well respected in the swimming industry and is now an International Speaker and trainer. In recent years she has attended and spoke as well as delivered workshops at conferences in Sweden, Florida, Brighton, Russia, Iceland and China. She regularly visits China several times per year working with businesses, training their teachers and helping with business development. She also is the only UK representative working with the China & Europe Aquapedagogy Research Centre (CEAPRC) who are working with China’s Ministry of Education to develop baby and toddler swimming further. Previously Lisa was a member of the STA Education committee and helped work on National Campaigns for baby & toddler swimming with Huggies SwimPant and was also an active Gamesmaker in London 2012 Olympics in the Aquatic Centre and the Athletes Village. In recent years Lisa completed a degree in Childhood Studies and volunteered for South Western Ambulance Service as a First Repsponder. Lisa is passionate about education and also delivers AquaSensory workshops and raising money for local charities.